For the musical composition, see Metastaseis (Xenakis). For the 2009 film, see Metastases (film). For the Spanish-language remake of Breaking Bad, see Metástasis. Metastasis is a pathogenic agent's spread from an initial or primary site to a different or secondary site within the host's body; it is typically spoken of as such spread by a cancerous tumor. The newly pathological sites, then, are metastases (mets). It is generally distinguished from cancer invasion, which is the direct extension and penetration by cancer cells into neighboring tissues. Cancer occurs after cells are genetically altered to proliferate rapidly and indefinitely. This uncontrolled proliferation by mitosis produces a primary heterogeneic tumour. The cells which constitute the tumor eventually undergo metaplasia, followed by dysplasia then anaplasia, resulting in a malignant phenotype. This malignancy allows for invasion into the circulation, followed by invasion to a second site for tumorigenesis. Some cancer cells known as circulating tumor cells acquire the ability to penetrate the walls of lymphatic or blood vessels, after which they are able to circulate through the bloodstream to other sites and tissues in the body. This process is known (respectively) as lymphatic or hematogenous spread. After the tumor cells come to rest at another site, they re-penetrate the vessel or walls and continue to multiply, eventually forming another clinically detectable tumor. This new tumor is known as a metastatic (or secondary) tumor. Metastasis is one of the hallmarks of cancer, distinguishing it from benign tumors. Most cancers can metastasize, although in varying degrees. Basal cell carcinoma for example rarely metastasizes. When tumor cells metastasize, the new tumor is called a secondary or metastatic tumor, and its cells are similar to those in the original or primary tumor. This means that if breast cancer metastasizes to the lungs, the secondary tumor is made up of abnormal breast cells, not of abnormal lung cells. The tumor in the lung is then called metastatic breast cancer, not lung cancer. Metastasis is a key element in cancer staging systems such as the TNM staging system, where it represents the "M". 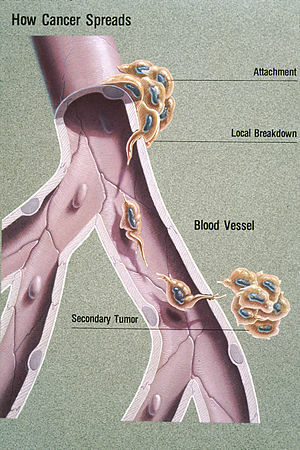 In overall stage grouping, metastasis places a cancer in Stage IV. The possibilities of curative treatment are greatly reduced, or often entirely removed, when a cancer has metastasized. Initially, nearby lymph nodes are struck early. The lungs, liver, brain, and bones are the most common metastasis locations from solid tumors. Although advanced cancer may cause pain, it is often not the first symptom. Some patients, however, do not show any symptoms. When the organ gets a metastatic disease it begins to shrink until its lymph nodes burst, or undergo lysis. Metastatic tumors are very common in the late stages of cancer. The spread of metastasis may occur via the blood or the lymphatics or through both routes. The most common places for the metastases to occur are the lungs, liver, brain, and the bones. Metastasis involves a complex series of steps in which cancer cells leave the original tumor site and migrate to other parts of the body via the bloodstream, via the lymphatic system, or by direct extension. To do so, malignant cells break away from the primary tumor and attach to and degrade proteins that make up the surrounding extracellular matrix (ECM), which separates the tumor from adjoining tissues. By degrading these proteins, cancer cells are able to breach the ECM and escape. The location of the metastases is not always random, with different types of cancer tending to spread to particular organs and tissues at a rate that is higher than expected by statistical chance alone. Breast cancer, for example, tends to metastasize to the bones and lungs. This specificity seems to be mediated by soluble signal molecules such as chemokines and transforming growth factor beta. The body resists metastasis by a variety of mechanisms through the actions of a class of proteins known as metastasis suppressors, of which about a dozen are known. Human cells exhibit three kinds of motion: collective motility, mesenchymal-type movement, and amoeboid movement. Cancer cells often opportunistically switch between different kinds of motion. Some cancer researchers hope to find treatments that can stop or at least slow down the spread of cancer by somehow blocking some necessary step in one or more kinds of motion. Cancer researchers studying the conditions necessary for cancer metastasis have discovered that one of the critical events required is the growth of a new network of blood vessels, called tumor angiogenesis. It has been found that angiogenesis inhibitors would therefore prevent the growth of metastases. Several different cell types are critical to tumor growth. In particular, endothelial progenitor cells have been shown to have a strong influence on the growth of tumor blood-vessels. Endothelial progenitor cells are also critical for metastasis and angiogenesis. Endothelial progenitor cells are important in tumor growth, angiogenesis and metastasis, and can be marked using the Inhibitor of DNA Binding 1 (ID1). This novel finding meant that investigators gained the ability to track endothelial progenitor cells from the bone marrow to the blood to the tumor-stroma and even incorporated in tumor vasculature. Endothelial progenitor cells incorporated in tumor vasculature suggests that this cell type in blood-vessel development is important in a tumor setting and metastasis. Furthermore, ablation of the endothelial progenitor cells in the bone marrow can lead to a significant decrease in tumor growth and vasculature development. Therefore, endothelial progenitor cells are important in tumor biology and present novel therapeutic targets. NFAT transcription factors are implicated in breast cancer, more specifically in the process of cell motility as the basis of metastasis formation. Indeed, NFAT1 (NFATC2) and NFAT5 are pro-invasive and pro-migratory in breast carcinoma and NFAT3 (NFATc4) is an inhibitor of cell motility. NFAT1 regulates the expression of the TWEAKR and its ligand TWEAK with the Lipocalin 2 to increase breast-cancer cell invasion  and NFAT3 inhibits Lipocalin 2 expression to blunt the cell invasion. Epigenetic regulation also plays an important role in the metastatic outgrowth of disseminated tumor cells. Metastases display alterations in histone modifications, such as H3K4-methylation and H3K9-methylation, when compared to matching primary tumors. These epigenetic modifications in metastases may allow the proliferation and survival of disseminated tumor cells in distant organs. A recent study shows that PKC-iota promotes melanoma cell invasion by activating Vimentin during EMT. PKC-iota inhibition or knockdown resulted an increase E-cadherin and RhoA levels while decreasing total Vimentin, phophorylated Vimentin (S39) and Par6 in metastatic melanoma cells. These results suggested that PKC-ι is involved in signaling pathways which upregulate EMT in melanoma thereby directly stimulates metastasis. Recently, a series of high-profile experiments suggests that the co-option of intercellular cross-talk mediated by exosome vesicles is a critical factor involved in all steps of the invasion-metastasis cascade. Main sites of metastases for some common cancer types. Primary cancers are denoted by "...cancer" and their main metastasis sites are denoted by "...metastases". The spread of a malignancy into body cavities can occur via penetrating the surface of the peritoneal, pleural, pericardial, or subarachnoid spaces. For example, ovarian tumors can spread transperitoneally to the surface of the liver. Lymphatic spread allows the transport of tumor cells to regional lymph nodes near the primary tumor and ultimately, to other parts of the body. This is called nodal involvement, positive nodes, or regional disease. "Positive nodes" is a term that would be used by medical specialists to describe regional lymph nodes that tested positive for malignancy. It is common medical practice to test by biopsy at least one lymph node near a tumor site when carrying out surgery to examine or remove a tumor. This lymph node is then called a sentinel lymph node. Lymphatic spread is the most common route of initial metastasis for carcinomas. In contrast, it is uncommon for a sarcoma to metastasize via this route. Localized spread to regional lymph nodes near the primary tumor is not normally counted as a metastasis, although this is a sign of a worse outcome. The lymphatic system does eventually drain from the thoracic duct and right lymphatic duct into the systemic venous system at the venous angle and into the brachiocephalic veins, and therefore these metastatic cells can also eventually spread through the haematogenous route. This is typical route of metastasis for sarcomas, but it is also the favored route for certain types of carcinoma, such as renal cell carcinoma originating in the kidney. Because of their thinner walls, veins are more frequently invaded than are arteries, and metastasis tends to follow the pattern of venous flow. That is, hematogenous spread often follows distinct patterns depending on the location of the primary tumor. For example, colorectal cancer spreads primarily through the portal vein to the liver. Some tumors, especially carcinomas may metastasize along anatomical canalicular spaces. These spaces include for example the bile ducts, the urinary system, the airways and the subarachnoid space. The process is similar to that of transcoelomic spread. However, often it remains unclear whether simultaneously diagnosed tumors of a canalicular system are one metastatic process or in fact independent tumors caused by the same agent (field cancerization). There is a propensity for certain tumors to seed in particular organs. This was first discussed as the "seed and soil" theory by Stephen Paget in 1889. The propensity for a metastatic cell to spread to a particular organ is termed 'organotropism'. For example, prostate cancer usually metastasizes to the bones. In a similar manner, colon cancer has a tendency to metastasize to the liver. Stomach cancer often metastasises to the ovary in women, then it is called a Krukenberg tumor. According to the "seed and soil" theory, it is difficult for cancer cells to survive outside their region of origin, so in order to metastasize they must find a location with similar characteristics. For example, breast tumor cells, which gather calcium ions from breast milk, metastasize to bone tissue, where they can gather calcium ions from bone. Malignant melanoma spreads to the brain, presumably because neural tissue and melanocytes arise from the same cell line in the embryo. In 1928, James Ewing challenged the "seed and soil" theory and proposed that metastasis occurs purely by anatomic and mechanical routes. This hypothesis has been recently utilized to suggest several hypotheses about the life cycle of circulating tumor cells (CTCs) and to postulate that the patterns of spread could be better understood through a 'filter and flow' perspective. However, contemporary evidences indicate that the primary tumour may dictate organotropic metastases by inducing the formation of pre-metastatic niches at distant sites, where incoming metastatic cells may engraft and colonise. Specifically, exosome vesicles secreted by tumours have been shown to home to pre-metastatic sites, where they activate pro-metastatic processes such as angiogenesis and modify the immune contexture, so as to foster a favourable microenvironment for secondary tumour growth. It is theorized that metastasis always coincides with a primary cancer, and, as such, is a tumor that started from a cancer cell or cells in another part of the body. However, over 10% of patients presenting to oncology units will have metastases without a primary tumor found. In these cases, doctors refer to the primary tumor as "unknown" or "occult," and the patient is said to have cancer of unknown primary origin (CUP) or unknown primary tumors (UPT). It is estimated that 3% of all cancers are of unknown primary origin. Studies have shown that, if simple questioning does not reveal the cancer's source (coughing up blood—"probably lung", urinating blood—"probably bladder"), complex imaging will not either. In some of these cases a primary tumor may appear later. The use of immunohistochemistry has permitted pathologists to give an identity to many of these metastases. However, imaging of the indicated area only occasionally reveals a primary. In rare cases (e.g., of melanoma), no primary tumor is found, even on autopsy. It is therefore thought that some primary tumors can regress completely, but leave their metastases behind. In other cases, the tumor might just be too small and/or in an unusual location to be diagnosed. For instance, breast cancer cells look the same whether they are found in the breast or have spread to another part of the body. So, if a tissue sample taken from a tumor in the lung contains cells that look like breast cells, the doctor determines that the lung tumor is a secondary tumor. Still, the determination of the primary tumor can often be very difficult, and the pathologist may have to use several adjuvant techniques, such as immunohistochemistry, FISH (fluorescent in situ hybridization), and others. Despite the use of techniques, in some cases the primary tumor remains unidentified. Metastatic cancers may be found at the same time as the primary tumor, or months or years later. When a second tumor is found in a patient that has been treated for cancer in the past, it is more often a metastasis than another primary tumor. It was previously thought that most cancer cells have a low metastatic potential and that there are rare cells that develop the ability to metastasize through the development of somatic mutations. According to this theory, diagnosis of metastatic cancers is only possible after the event of metastasis. Traditional means of diagnosing cancer (e.g. a biopsy) would only investigate a subpopulation of the cancer cells and would very likely not sample from the subpopulation with metastatic potential. The somatic mutation theory of metastasis development has not been substantiated in human cancers. Rather, it seems that the genetic state of the primary tumor reflects the ability of that cancer to metastasize. Research comparing gene expression between primary and metastatic adenocarcinomas identified a subset of genes whose expression could distinguish primary tumors from metastatic tumors, dubbed a "metastatic signature." Up-regulated genes in the signature include: SNRPF, HNRPAB, DHPS and securin. Actin, myosin and MHC class II down-regulation was also associated with the signature. Additionally, the metastatic-associated expression of these genes was also observed in some primary tumors, indicating that cells with the potential to metastasize could be identified concurrently with diagnosis of the primary tumor. Recent work identified a form of genetic instability in cancer called chromosome instability (CIN) as a driver of metastasis. In aggressive cancer cells, loose DNA fragments from unstable chromosomes spill in the cytosol leading to the chronic activation of innate immune pathways, which are hijacked by cancer cells to spread to distant organs. Expression of this metastatic signature has been correlated with a poor prognosis and has been shown to be consistent in several types of cancer. Prognosis was shown to be worse for individuals whose primary tumors expressed the metastatic signature. Additionally, the expression of these metastatic-associated genes was shown to apply to other cancer types in addition to adenocarcinoma. Metastases of breast cancer, medulloblastoma and prostate cancer all had similar expression patterns of these metastasis-associated genes. The identification of this metastasis-associated signature provides promise for identifying cells with metastatic potential within the primary tumor and hope for improving the prognosis of these metastatic-associated cancers. Additionally, identifying the genes whose expression is changed in metastasis offers potential targets to inhibit metastasis. Metastasis proven by liver biopsy (tumor (adenocarcinoma) - lower two-thirds of image). H&E stain. Treatment and survival is determined, to a great extent, by whether or not a cancer remains localized or spreads to other locations in the body. If the cancer metastasizes to other tissues or organs it usually dramatically increases a patient's likelihood of death. Some cancers—such as some forms of leukemia, a cancer of the blood, or malignancies in the brain—can kill without spreading at all. Once a cancer has metastasized it may still be treated with radiosurgery, chemotherapy, radiation therapy, biological therapy, hormone therapy, surgery, or a combination of these interventions ("multimodal therapy"). The choice of treatment depends on a large number of factors, including the type of primary cancer, the size and location of the metastases, the patient's age and general health, and the types of treatments used previously. In patients diagnosed with CUP it is often still possible to treat the disease even when the primary tumor cannot be located. Current treatments are rarely able to cure metastatic cancer though some tumors, such as testicular cancer and thyroid cancer, are usually curable. Palliative care, care aimed at improving the quality of life of people with major illness, has been recommended as part of management programs for metastasis. Although metastasis is widely accepted to be the result of the tumor cells migration, there is a hypothesis saying that some metastases are the result of inflammatory processes by abnormal immune cells. The existence of metastatic cancers in the absence of primary tumors also suggests that metastasis is not always caused by malignant cells that leave primary tumors. In March 2014 researchers discovered the oldest complete example of a human with metastatic cancer. The tumors had developed in a 3,000-year-old skeleton found in 2013 in a tomb in Sudan dating back to 1200 BC. The skeleton was analyzed using radiography and a scanning electron microscope. These findings were published in the Public Library of Science journal. Metastasis is a Greek word meaning "displacement", from μετά, meta, "next", and στάσις, stasis, "placement". ^ "Metastasis", Merriam–Webster online, accessed 20 Aug 2017. ^ "What is Metastasis?". Cancer.Net. 2 February 2016. ^ Klein CA (September 2008). "Cancer. The metastasis cascade". Science. 321 (5897): 1785–7. doi:10.1126/science.1164853. PMID 18818347. ^ Chiang AC, Massagué J (December 2008). "Molecular basis of metastasis". The New England Journal of Medicine. 359 (26): 2814–23. doi:10.1056/NEJMra0805239. PMC 4189180. PMID 19109576. ^ "Invasion and metastasis". Cancer Australia. 2014-12-16. Retrieved 2018-10-26. ^ Maheswaran, Shyamala; Haber, Daniel A. (2010-02-01). "Circulating tumor cells: a window into cancer biology and metastasis". Current Opinion in Genetics & Development. 20 (1): 96–99. doi:10.1016/j.gde.2009.12.002. ISSN 0959-437X. PMC 2846729. PMID 20071161. ^ a b c d Kumar V, Abbas AK, Fausto N, Robbins SL, Cotran RS (2005). Robbins and Cotran pathologic basis of disease (7th ed.). Philadelphia: Elsevier Saunders. ISBN 978-0-7216-0187-8. ^ "O que é a metástase?". Dr. Felipe Ades MD PhD - Oncologista (in Portuguese). 2018-07-24. Retrieved 2018-10-23. ^ "Metastatic Cancer: Questions and Answers". National Cancer Institute. Retrieved 2008-08-28. ^ Nguyen DX, Massagué J (2007). "Genetic determinants of cancer metastasis". Nature Reviews. Genetics. 8 (5): 341–52. doi:10.1038/nrg2101. PMID 17440531. ^ Zlotnik A, Burkhardt AM, Homey B (2011). "Homeostatic chemokine receptors and organ-specific metastasis". Nature Reviews. Immunology. 11 (9): 597–606. doi:10.1038/nri3049. PMID 21866172. ^ Drabsch Y, ten Dijke P (2011). "TGF-β signaling in breast cancer cell invasion and bone metastasis". Journal of Mammary Gland Biology and Neoplasia. 16 (2): 97–108. doi:10.1007/s10911-011-9217-1. PMC 3095797. PMID 21494783. ^ Yoshida BA, Sokoloff MM, Welch DR, Rinker-Schaeffer CW (November 2000). "Metastasis-suppressor genes: a review and perspective on an emerging field". Journal of the National Cancer Institute. 92 (21): 1717–30. doi:10.1093/jnci/92.21.1717. PMID 11058615. ^ Weidner N, Semple JP, Welch WR, Folkman J (January 1991). "Tumor angiogenesis and metastasis--correlation in invasive breast carcinoma". The New England Journal of Medicine. 324 (1): 1–8. doi:10.1056/NEJM199101033240101. PMID 1701519. ^ Gao D, Nolan DJ, Mellick AS, Bambino K, McDonnell K, Mittal V (January 2008). "Endothelial progenitor cells control the angiogenic switch in mouse lung metastasis" (PDF). Science. 319 (5860): 195–8. Bibcode:2008Sci...319..195G. doi:10.1126/science.1150224. PMID 18187653. ^ Nolan DJ, Ciarrocchi A, Mellick AS, Jaggi JS, Bambino K, Gupta S, Heikamp E, McDevitt MR, Scheinberg DA, Benezra R, Mittal V (June 2007). "Bone marrow-derived endothelial progenitor cells are a major determinant of nascent tumor neovascularization". Genes & Development. 21 (12): 1546–58. doi:10.1101/gad.436307. PMC 1891431. PMID 17575055. ^ Mellick AS, Plummer PN, Nolan DJ, Gao D, Bambino K, Hahn M, Catena R, Turner V, McDonnell K, Benezra R, Brink R, Swarbrick A, Mittal V (September 2010). "Using the transcription factor inhibitor of DNA binding 1 to selectively target endothelial progenitor cells offers novel strategies to inhibit tumor angiogenesis and growth". Cancer Research. 70 (18): 7273–82. doi:10.1158/0008-5472.CAN-10-1142. PMC 3058751. PMID 20807818. ^ Jauliac S, López-Rodriguez C, Shaw LM, Brown LF, Rao A, Toker A (July 2002). "The role of NFAT transcription factors in integrin-mediated carcinoma invasion". Nature Cell Biology. 4 (7): 540–4. doi:10.1038/ncb816. PMID 12080349. ^ Yoeli-Lerner M, Yiu GK, Rabinovitz I, Erhardt P, Jauliac S, Toker A (November 2005). "Akt blocks breast cancer cell motility and invasion through the transcription factor NFAT". Molecular Cell. 20 (4): 539–50. doi:10.1016/j.molcel.2005.10.033. PMID 16307918. ^ a b Fougère M, Gaudineau B, Barbier J, Guaddachi F, Feugeas JP, Auboeuf D, Jauliac S (April 2010). "NFAT3 transcription factor inhibits breast cancer cell motility by targeting the Lipocalin 2 gene". Oncogene. 29 (15): 2292–301. doi:10.1038/onc.2009.499. PMID 20101218. ^ Gaudineau B, Fougère M, Guaddachi F, Lemoine F, de la Grange P, Jauliac S (October 2012). "Lipocalin 2, the TNF-like receptor TWEAKR and its ligand TWEAK act downstream of NFAT1 to regulate breast cancer cell invasion". Journal of Cell Science. 125 (Pt 19): 4475–86. doi:10.1242/jcs.099879. PMID 22767506. ^ Franci C, Zhou J, Jiang Z, Modrusan Z, Good Z, Jackson E, Kouros-Mehr H (2013). "Biomarkers of residual disease, disseminated tumor cells, and metastases in the MMTV-PyMT breast cancer model". PLOS One. 8 (3): e58183. Bibcode:2013PLoSO...858183F. doi:10.1371/journal.pone.0058183. PMC 3592916. PMID 23520493. ^ Lujambio A, Esteller M (February 2009). "How epigenetics can explain human metastasis: a new role for microRNAs". Cell Cycle. 8 (3): 377–82. doi:10.4161/cc.8.3.7526. PMID 19177007. ^ Ratnayake WS, Apostolatos AH, Ostrov DA, Acevedo-Duncan M (November 2017). "Two novel atypical PKC inhibitors; ACPD and DNDA effectively mitigate cell proliferation and epithelial to mesenchymal transition of metastatic melanoma while inducing apoptosis". International Journal of Oncology. 51 (5): 1370–1382. doi:10.3892/ijo.2017.4131. PMC 5642393. PMID 29048609. ^ a b c Syn N, Wang L, Sethi G, Thiery JP, Goh BC (July 2016). "Exosome-Mediated Metastasis: From Epithelial-Mesenchymal Transition to Escape from Immunosurveillance". Trends in Pharmacological Sciences. 37 (7): 606–17. doi:10.1016/j.tips.2016.04.006. PMID 27157716. ^ Hart IR (1982). "'Seed and soil' revisited: mechanisms of site-specific metastasis". Cancer Metastasis Reviews. 1 (1): 5–16. doi:10.1007/BF00049477. PMID 6764375. ^ Weinberg RA (2007). The Biology of Cancer. New York: Taylor & Francis. ISBN 978-0-8153-4076-8. quoted in Angier N (3 April 2007). "Basics: A mutinous group of cells on a greedy, destructive task". New York Times. ^ Scott J, Kuhn P, Anderson AR (July 2012). "Unifying metastasis--integrating intravasation, circulation and end-organ colonization". Nature Reviews. Cancer. 12 (7): 445–6. doi:10.1038/nrc3287. PMC 4533867. PMID 22912952. ^ Ettinger DS, Agulnik M, Cates JM, Cristea M, Denlinger CS, Eaton KD, et al. (December 2011). "NCCN Clinical Practice Guidelines Occult primary". Journal of the National Comprehensive Cancer Network. 9 (12): 1358–95. doi:10.6004/jnccn.2011.0117. PMID 22157556. ^ a b Briasoulis E, Pavlidis N (1997). "Cancer of Unknown Primary Origin". The Oncologist. 2 (3): 142–152. PMID 10388044. ^ Poste G, Fidler IJ (January 1980). "The pathogenesis of cancer metastasis". Nature. 283 (5743): 139–46. Bibcode:1980Natur.283..139P. CiteSeerX 10.1.1.553.5472. doi:10.1038/283139a0. PMID 6985715. ^ a b c d e f Ramaswamy S, Ross KN, Lander ES, Golub TR (January 2003). "A molecular signature of metastasis in primary solid tumors". Nature Genetics. 33 (1): 49–54. doi:10.1038/ng1060. PMID 12469122. ^ van 't Veer LJ, Dai H, van de Vijver MJ, He YD, Hart AA, Mao M, et al. (January 2002). "Gene expression profiling predicts clinical outcome of breast cancer". Nature. 415 (6871): 530–6. doi:10.1038/415530a. hdl:1874/15552. PMID 11823860. ^ Bakhoum SF, Ngo B, Laughney AM, Cavallo JA, Murphy CJ, Ly P, et al. (January 2018). "Chromosomal instability drives metastasis through a cytosolic DNA response". Nature. 553 (7689): 467–472. Bibcode:2018Natur.553..467B. doi:10.1038/nature25432. PMC 5785464. PMID 29342134. ^ Irwin KE, Greer JA, Khatib J, Temel JS, Pirl WF (2013). "Early palliative care and metastatic non-small cell lung cancer: potential mechanisms of prolonged survival". Chronic Respiratory Disease. 10 (1): 35–47. doi:10.1177/1479972312471549. PMID 23355404. ^ Shahriyari L (2016). "A new hypothesis: some metastases are the result of inflammatory processes by adapted cells, especially adapted immune cells at sites of inflammation". F1000Research. 5: 175. doi:10.12688/f1000research.8055.1. PMC 4847566. PMID 27158448. ^ López-Lázaro M (2015-01-01). "The migration ability of stem cells can explain the existence of cancer of unknown primary site. Rethinking metastasis". Oncoscience. 2 (5): 467–75. doi:10.18632/oncoscience.159. PMC 4468332. PMID 26097879. ^ Kelland K (17 March 2014). "Archaeologists discover earliest example of human with cancer". Reuters. Retrieved 18 March 2014. ^ Ghosh P (18 March 2014). "Ancient skeleton is the earliest case of cancer yet detected". BBC. Retrieved 18 March 2014. ^ Ross P (17 March 2014). "Possible Oldest Cancer Found In 3,000-Year-Old Skeleton Could Reveal 'Evolution' Of Modern Disease". International Business Times. Retrieved 18 March 2014. Look up metastasis in Wiktionary, the free dictionary. 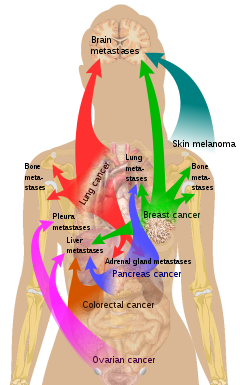 Wikimedia Commons has media related to Metastases. This page was last edited on 26 February 2019, at 18:48 (UTC).